Every week we pick a word and each base a post off that word. Check out the whole series here. This week, the word is: Moment. defining moment: a point at which the essential nature or character of a person, group, etc., is revealed or identified. I think this might be my favorite song of all time. Do you know how hard it is to actually live in the moment? This is something people spend a lifetime trying to achieve. No matter where I am, I tend to get caught up in the same distractions. I have found that whether I am in Cleveland or New Zealand, I have the same insecurities, fears and distorted beliefs. 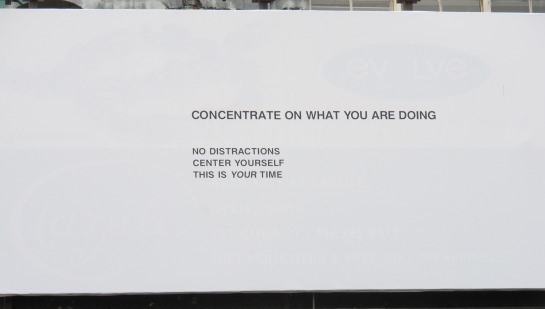 This picture is of a billboard in Wellington, New Zealand. I could not have seen it at a more perfect time. I think the key to this traveling experience for me will be to live in the moment as much as I can. 1. Pay attention to your senses. When things become only sensory, you really feel the moment. Try it out, whatdya got to loose?